Preventive dental care is worthwhile throughout your life, no matter what your age is. By practicing good oral hygiene at home and scheduling regular checkups with our office, you can help keep your smile bright and healthy for many years to come. Remove surface stains from teeth through polishing. At Precision Dental, our dental team uses digital x-rays which have several advantages over traditional film based x-rays. They emit up to 90% less radiation, are ready for examination nearly instantly, can be viewed by the patient and dentist on a computer screen, and they are greener; no chemicals are needed for processing. Gum disease accounts for approximately 70% of all tooth loss in adults. Early signs of gum disease include bleeding gums when flossing or brushing and gums that are red, inflamed, or swollen. Gum disease and tooth decay are caused by the same bacteria. These bacteria form plaque beneath the gum-line, which eats away at the bond between tooth and gum. If deterioration is allowed to continue, "pockets" form in between the teeth and the gums. Pockets deeper than 3ml may require special treatment to remove the bacteria and plaque. Without treatment and continuous maintenance, gum disease will eventually weaken the bonds that hold the teeth in place. There is no permanent treatment for gum disease. However, it can be kept under control with proper personal hygiene and regular visits to a trained dentist or hygienist. Many people subconsciously grind their teeth in times of stress or during sleep. When coming together, the strong force of the teeth and jaws can cause grinding and microfractures, resulting in prematurely worn teeth. The dentist at Precision Dental offer mouthguards (also called night guards) to protect teeth against premature wearing. For nighttime use only, these professional mouthguards can prevent painful jaws, tooth damage and even TMJ issues. Precision Dental uses several varieties of high quality mouthguards, depending on the needs of the patient. Every mouthguard is custom-fitted for your mouth, to offer the best comfort. Using store-bought boil-and-bite mouthguards can result in a bulky fit, and inferior materials that could cause bite problems. The right quality mouthguard will not only protect your teeth, but your peace of mind. Request a consultation from our dentist for this protective solution today! Just thinking about going to the dentist makes most people cringe. Let Dr Quan change your mind. I got 4 wisdom teeth pulled before I even knew. He's fast, thorough and caring. He takes his time to talk you through the process, explain everything and give you advice on how to keep your pearly whites healthy. The assistants are nice as well. I'm going to do the zoom teeth whitening. I've been to many dentist, but I've never been this comfortable. If you're looking for a good dentist, I highly recommend Precision Dental. If you hate to go to the dentist, this is the place for you! Dr Quan is the nicest, politest, most gentle caring dentist you will ever deal with. I drive over 60 miles just to get work done. Before him, I willfully abstained from going to the dentist for over 10 years. I really do Love to go see dr Q!!! He makes every experience Great! I love how he is FOR REALs about wat u need ta do wit ur teeth and not try to upsale his ticket so he makes more money off u! yes yes go see dr Q!!! thanks dr Q ur the BEST!!!!! Precision Dental offers the very best for your family’s dental health. 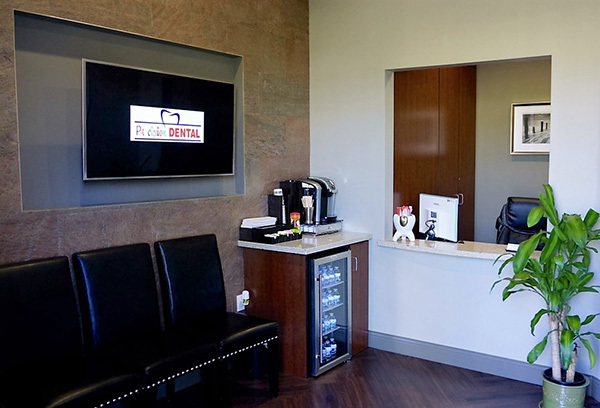 Serving the San Diego area since 2003, our office delivers “Personalized Dentistry With a Smile” for all ages. When you visit Precisiondental, your concern is our top priority. Copyright © 2015 Precision Dental. All rights reserved.